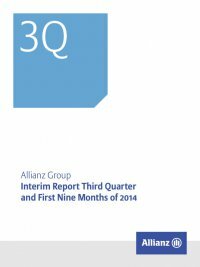 Interim Report Third Quarter and First Nine Months of 2014 Allianz Group 1 Content Basic Share Information Security codes WKN 840 400 ISIN DE 000 840 400 5 Bloomberg ALV GR Reuters 0#ALVG.DEU  3 A Interim Group Management Report  4 Content  5 Executive Summary 12 Property-Casualty Insurance Operations 22 Life/Health Insurance Operations 28 Asset Management 32 Corporate and Other 35 Outlook 37 Balance Sheet Review 44 Reconciliations To go directly to any chapter, simply click on the headline or the page number All references to chapters, pages, notes, internet pages, etc. within this report are also linked. 47 B Condensed Consolidated Interim Financial Statements  48 Content  49 Consolidated Balance Sheets  50 Consolidated Income Statements  51 Consolidated Statements of Comprehensive Income  52 Consolidated Statements of Changes in Equity  53 Consolidated Statements of Cash Flows  55 Notes Development of the ­Allianz share price versus STOXX Europe 600 Insurance and EURO STOXX 50 indexed to the ­Allianz share price in € 160 140 120 100 1Q € 104.80 (12/28/2012) € 130.35 (12/30/2013) € 128.35 (9/30/2014) 2Q 3Q 2013 1Q 2Q 3Q4Q 2014 ­Allianz STOXX Europe 600 Insurance EURO STOXX 50 Source: Thomson Reuters Datastream Allianz Share Allianz Share price (9M 2014): High: € 138.45 (9/19/2014) Low: € 117.20 (4/15/2014) Disclaimer regarding Roundings The condensed consolidated interim financial statements are presented in millions of Euros (€ MN), unless otherwise stated. Due to rounding, numbers presented may not add up pre- cisely to the totals provided and percentages may not precisely reflect the absolute figures. Previously published figures have been adjusted accordingly.